This article was posted on 9th November 2016. But the fashion world waits for no man (or woman), and with the last model having sashayed down the runway for 2017, the trends are out there ready to be explored and re-interpreted for interior addicts like ourselves. 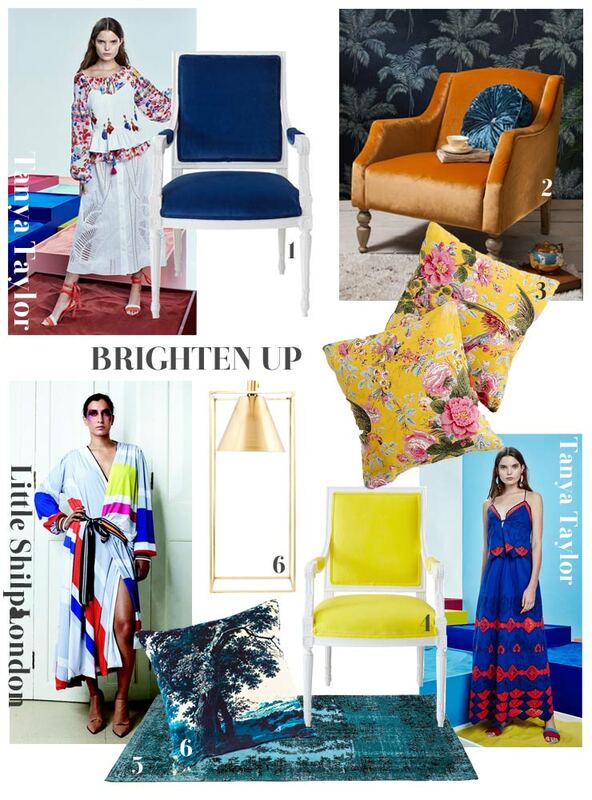 Trends take their influence far and wide, though we must admit it’s those catwalk moments that captivate us and get us thinking what might be in store for the world of interiors. So many of the fashion trends for the season lend themselves with perfection to the home, impacting what we go on to buy. Think it’s a coincidence that your new velvet pleated skirt matches your sumptuous new velvet cushion? Think again. That, my friend, was written in the stars of the A/W16 fashion shows. Summer and white are a match made in heaven. Think beach side cabanas, with delicately draped white fabric ruffling in the breeze *googles flights to the Caribbean*. White is perfection yet some might consider it a bore, as if white has no imagination or creativity in the home. We respectfully disagree, white brings a feeling of peace and serenity – something we could all do with a little (or a lot) more of. 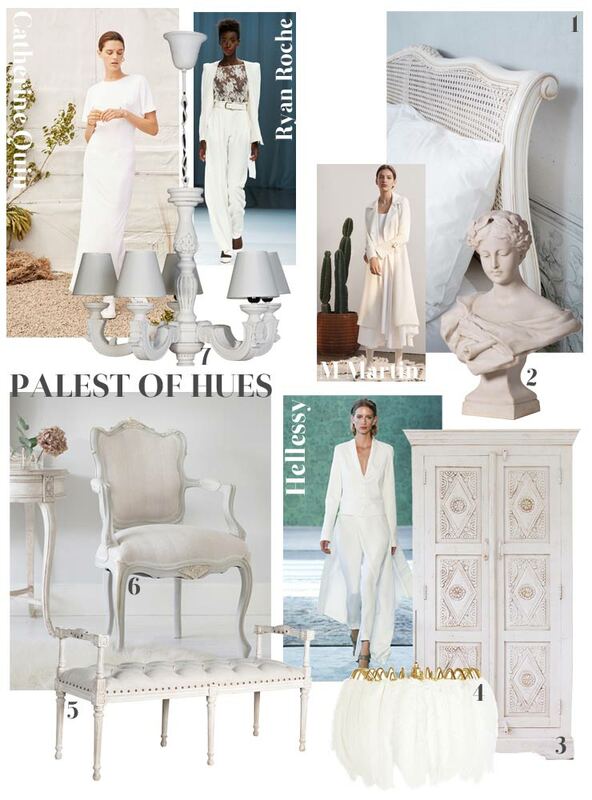 It’s how you pair your pale hero pieces that makes the trend; whether it’s with natural woods for texture and that Scandi cabin-chic vibe, shades of the sky and deep seas reminiscent of Santorini, or a touch of gold glamour for maximum magpie-style impact. 1. White Rattan Bed. 2. Grecian Bust. 3. White Painted Armoire. 4. Feather Pendant Light. 5. White Bedroom Bench. 6. Grey French Chair. 7. White Wooden Chandelier. 1. Blue Velvet French Chair. 2. Orange Velvet Chair. 3. Yellow Floral Cushions. 4. Yellow Velvet Chair. 5. Blue Kilim Floor Rug. 6. Gold Modern Lamp. 1. White Ruffle Bed Linen. 2. Dark Blue Linen Cushions. 3. 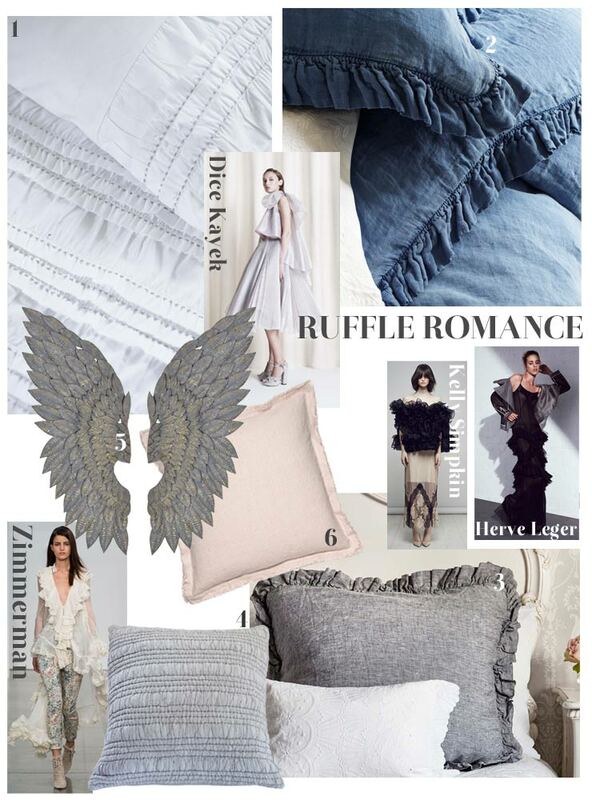 Grey Ruffle Cushions. 4. Grey Ruched Cushion. 5. Angel Wings. 6. Pink Cushion. In part two of our 2017 trend report we'll be looking at refreshing your pretty pinks and adding a touch of drama with deep, sultry blues.